I often have people tell me that they would love to try going vegan but they just dont have the time. Well I’m here to tell you that eating vegan can be super quick and easy! One of my favourite meals on the go would definitely be a good smoothie. 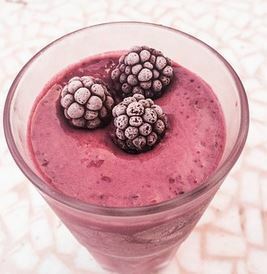 Now a lot of people go to a lot of trouble with their smoothies adding protein powders, supposed ‘superfoods’, vegan milks,etc., which is all well and good but if you’re like me and either can’t afford dozens of ingredients for one meal or can’t be bothered then this recipe is perfect for you! I love mixed berry smoothies because theyre sweet with a tangy from the rasberries and super refreshing.